We have a couple remaining adventures to talk about from October, but very few pictures, so we decided just to do a combo post for them. 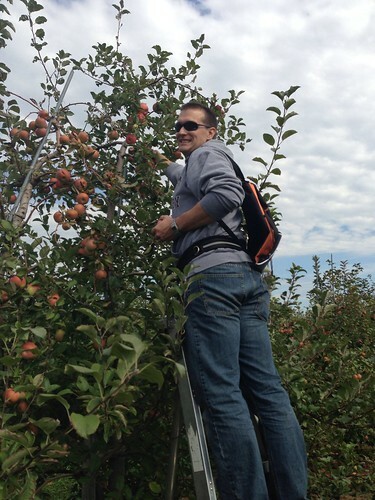 We mentioned that we went apple picking on our birthday. It was really fun. 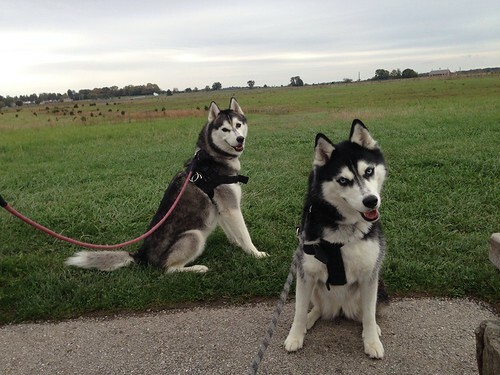 We met up with Quest and Luca from the Husky Brigade, along with their humans. Unfortunately Mom barely took any pictures because she is a slacker like that. 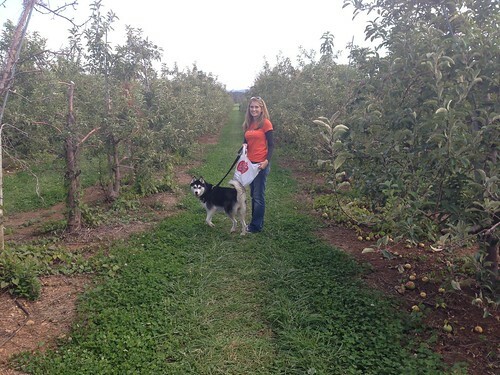 We have this one picture of Mom and Kat trying to find some granny smith apples. And here's Dad and me picking some fujis, Dad's favorite. We found some really good ones up high, so Dad found a ladder so he could pick them. 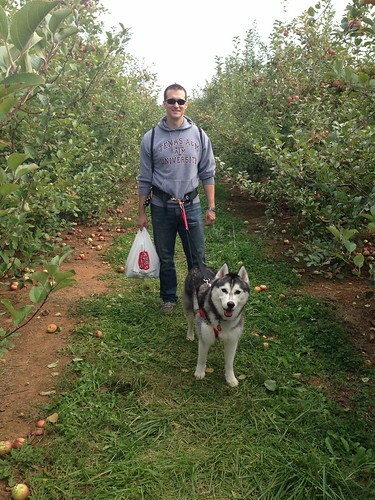 We got a lot of attention while apple picking. If you can imagine how much attention two huskies get, just imagine how much attention four huskies get! Also in October we went to Gettysburg. It was raining, so we only got out of the car once. We walked out to where Pickett's charge began. After we took this picture, as we were walking back to the car, a group of people from a tour bus was walking out to the picture spot. We stood off to the side of the path to let them all by, but everyone stopped to pet us. In fact, the tour guide stopped the tour so that no one got left behind while admiring us. So I'm pretty sure we are more exciting than Civil War history. 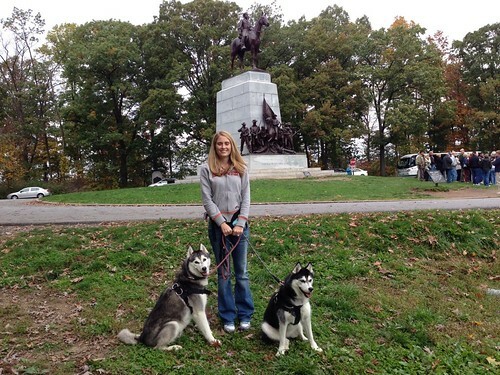 Do you think there were any Siberian Huskies in the Battle of Gettysburg? At the same spot, we took our picture next to the Virginia monument, since we are now Virginians. 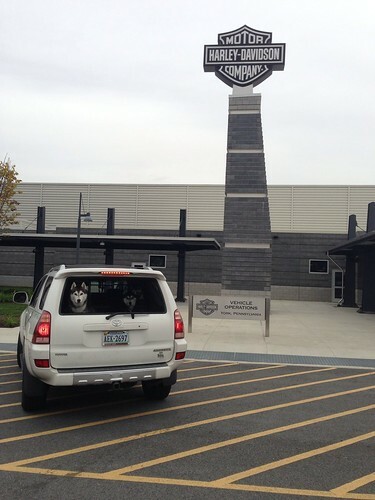 We also went to the Harley Davidson plant. Mom and Dad took at tour and we made sure that no one bothered the 4Runner. Do you think I would look good in a sidecar if Dad got a Harley? Well, that's our October wrap-up. We haven't had any adventures in November yet, but we'll try to make sure we get some good ones!